Jim Flewellyn stands in front of the damaged farmhouse on his property west of Ottawa, which he had just recently bought before a tornado hit the area in September. The Flewellyns work three properties, two near Kinburn, Ont., and one in nearby Stittsville that was once his parents’ farm. Jim Flewellyn knew something was up – but it would take most of the day to find out how much would end up down. It was Friday afternoon, Sept. 21. The 47-year-old dairy farmer knew about the “severe weather warning” for his rural area northwest of Ottawa. He noticed that Harley, his constant companion on the farm, was getting skittish, which was most uncommon for the friendly five-year-old Australian shepherd. With the wind coming up, he began making sure his cows and calves were all under cover and began moving machinery into the sheds. It was then that he noticed a long string of cars and trucks turning in his laneway and heading back down Kinburn Side Road. Someone shouted that there were hydro poles down over the road and no one was getting through to the highway. And then the winds really picked up. Gone? How could that be? The Flewellyns, Jim and Lisa, had just purchased the farm down on Mohr’s Road after the passing of long-time farmer Mr. White. But that was far from all that was gone. The EF-3 (Enhanced Fujita scale) tornado, which first touched down at 4:40 p.m., ripped through communities in Eastern Ontario and western Quebec for the better part of an hour. Thirty homes in nearby Dunrobin were either destroyed or had to be demolished. Hundreds of housing units were damaged in Gatineau, across the Ottawa River. Nearly 150,000 lost power to their homes. 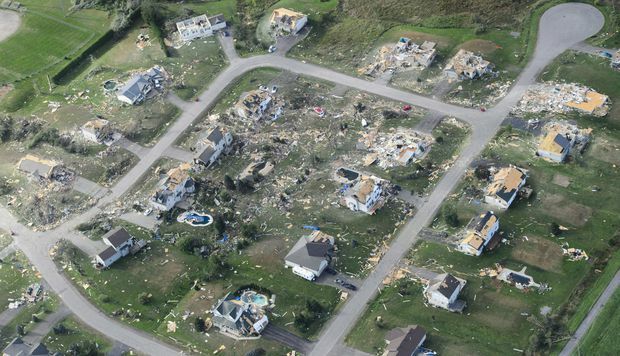 Sept. 22, 2018: Damaged homes in Dunrobin, Ont., after the tornado passed through. In all, six tornadoes struck that day, injuring 30 but miraculously killing none. They left behind nearly $300-million in insurance claims on both sides of the river. Unfortunately, Mr. Flewellyn had none on the farm on Mohr’s Road. When he reached his newly purchased property, he was stunned by the devastation. He had lost two machine sheds, two 30-metre-tall silos. His barn was ripped from its foundation. New doors that he had purchased for one of the sheds were found more than a kilometre away – “and they were in perfect shape!” The porch of the red brick house was nowhere to be seen. In all, 16 structures had been destroyed. The Flewellyns’ plan had been to fix things up – the house had faulty wiring, to begin with – and then see about insurance. But now, what was the point? “There’s not much to renovate now,” he said. His cellphone rang again. Someone else calling who knew nothing about the tornado but wanted to talk about the renegotiations on the North American free-trade agreement, with strong suggestions that Canada was prepared to make concessions on dairy if it would close the deal with the United States. Jim Flewellyn's herd of dairy cows was safe when the tornado came, but weeks later another calamity arrived: Canada agreed to open up part of its protected dairy market in a trade deal with the United States and Mexico. True enough. There were no animals at the farm that was hardest hit. The Flewellyns’ dairy herd of 110 – 50 of them at any one time being milked – was safe, as were the two dozen or so barn cats and, of course, happy Harley. The idea was to use the newly purchased farm for pasture and crops anyway, and the land itself had survived quite well. However, the rumours about dairy farmers being sacrificed to gain a trade pact came true barely a week after the tornado struck when the new deal – now to be known as USMCA (United States-Mexico-Canada Agreement) – was reached. In order to get Canada and the United States to sign on (Mexico and the United States had earlier reached an agreement), the Canadian negotiators had given concessions on dairy. American producers would have greater access to the Canadian dairy market – they had lobbied for that for years – worth approximately 3.6 per cent of the total market. The agreement also brings an end to what is known as “Class 7,” a trade arrangement that has controlled prices on such matters as skim-milk powder, a control Canadian producers wished to keep in place. In addition, the United States gains the right to be consulted on any changes to Canada’s classification system for dairy, something farmers say they were told would not happen. Foreign Affairs Minister Chrystia Freeland said that there would be compensation for losses, but dairy spokespeople shot back that this wasn’t so much an issue of money as it was one of livelihood. The family farm was again under siege. 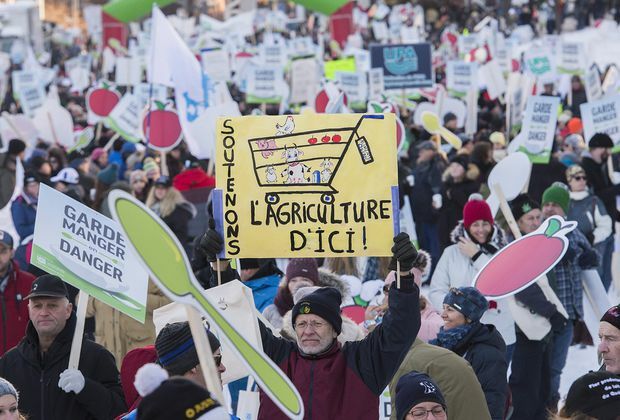 Nov. 18, 2018: People attend a Montreal march in support of the Canadian dairy sector and other farmers, a few weeks after the USMCA breakthrough was announced. According to the Canadian Dairy Information Centre, there are 10,951 dairy farms in the country, with close to a million dairy cows and approximately half as many heifers (female that has yet to give birth). The Canadian Agricultural Human Resource Council says that the industry employed nearly 40,000 workers in 2014, 11 per cent of the total agricultural labour force. Dairy Farmers of Canada says 220,000 Canadian families are dependent on dairy, if related jobs such as transportation, processing and retail are taken into consideration. Regardless, three-quarters of the dairy work force is located in two provinces, Ontario and Quebec, and more in Quebec than in Ontario, which is why protecting dairy farmers became a key issue in the recent Quebec provincial election and the federal Conservative leadership vote. At the core of dairy concerns is the quota system, introduced in the early 1970s with the intention of “saving the family farm” by guaranteeing a stable market for producers. Quota is a government-mandated cap, which varies from province to province, on how much dairy product a farmer can sell to a marketing board. The value of quota is per kilogram of butterfat, which works out roughly to an amount per milk cow. An Ontario dairy producer’s quota is worth $24,000 a cow. While the original intent somewhat worked – by bringing stability to the family dairy farm – in recent years, there has been growing criticism. The price of quota is often seen as a barrier for young farmers keen to have the rural lifestyle quota was created to protect. An average-sized herd, somewhat smaller than what Mr. Flewellyn has, would cost around $2-million to establish in Quebec and Ontario. Ian Lee, an associate professor of management at Carleton University’s Sprott School of Business, has long been a critic of the Canadian supply-management system. Prof. Lee maintains, and many agree, that the system designed long ago to save the family farm has contributed mightily to its shrinkage. In 1967, the country had 174,139 dairy farms. Fifty years later, that number had shrunk to 10,951. The very argument in favour of supply management, he maintains, is actually an argument against it. “There’s no incentive when the price is fixed,” he says. “Supply management killed the very thing that makes other markets vital, and that’s innovation. Jim Flewellyn feeds his dairy cows. The cows are milked twice a day. In the spring, between milkings, he will also plant – corn, soya, wheat – and work as late as midnight. In fall, he combines until dark. Son Colby, 16, helps before and after school. Daughter Maggie, 19, is studying agriculture at the University of Guelph’s Ridgetown campus. The Flewellyns work three properties, the two near Kinburn and one in nearby Stittsville that was once his parents’ farm. When his father passed away in 1981, his mother sold off their cows and quota but kept the farm. After he graduated from the Kemptville Agricultural College – another affiliate of the University of Guelph, since closed – in 1991, he began working the farm within six months. “My assets came from my mom and dad,” he says. Had he not begun with an advantage, he doubts he could have built his holdings into today’s 800 acres. The automated system allows Mr. Flewellyn to milk eight cows at a time. If a cow is not cleaned properly before milking, alarms will go off. Any problems are recorded by computer, and the milk inspector, who comes at least once a year, has full access to all the gathered data. The waste from the milking cows is quickly cleared from the gutters and mechanically moved out to a manure pit some distance from the barn. Breeding is all done artificially. Male offspring are auctioned off as calves, usually for veal production. They use DNA testing to determine which calves are likely to be the most productive. He knows there has been much criticism of supply management in recent years, from academics such as Prof. Lee to Martha Hall Findlay of the Canada West Foundation to Max Bernier, former minister in the cabinet of Stephen Harper and now Leader of the People’s Party of Canada. Once U.S President Donald Trump began targeting dairy in the early talks to renegotiate NAFTA, dairy farmers knew they would be taking a hit. “I’m not surprised they gave something away,” Mr. Flewellyn says. 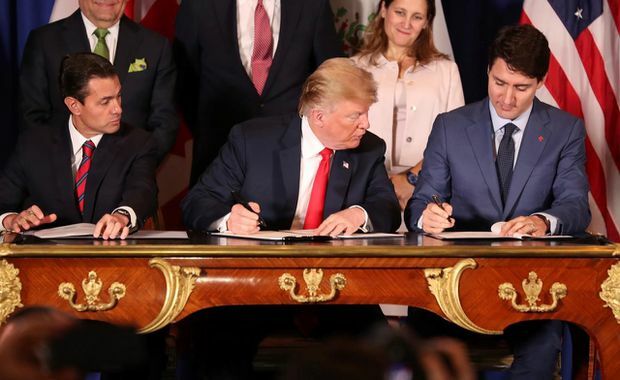 Nov. 30, 2018: U.S. President Donald Trump, middle, looks over at Canadian Prime Minister Justin Trudeau's document at the USMCA official signing in Buenos Aires. At left is Mexico's then-president, Enrique Pena Nieto. He says that the USMCA and other recent agreements with European and Pacific trading partners have chipped away at Canadian dairy producers to a point where, in his estimate, he could lose at least 10 per cent of his business to foreign competition, which would in effect lower the amount of milk products he could sell. He has little confidence in any promised “compensation” from the government and is convinced that it will have far too many strings attached for him to bother pursuing. There are days when he wonders if the family farm will continue on in the Flewellyn family once Maggie and Colby are finished with their schooling. “I always say I will continue on and I will keep farming and do everything until they’re 30,” he says. “And if they’re not home or not showing any interest by the time they’re 30, they’re not coming back. Jim Flewellyn feeds the dairy cows at his farm.